FIRST, is so very appreciative of the generosity of the ichthyosis community. If this year’s IAM told us anything, it’s that we are surrounded by a community of loving, caring and committed individuals. And although it is rather small numbers, our entire community makes great efforts, each and every day, to offer support, raise awareness, and connect. 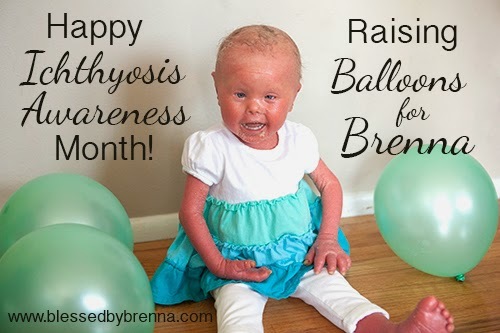 Initially, the Westlake family, whose daughter Brenna is affected with harlequin ichthyosis, set out with a goal of raising $3,000 with their online campaign, Balloons for Brenna, during Ichthyosis Awareness Month. However this year IAM took on a life of its own – as families like the Westlakes stepped out and raised awareness sky high, through the entire community. In the end, the Westlakes surpassed their goal, raising over $3,600! Additionally, Courtney Westlake spent much of the month of May writing not only for her own blog, Blessed by Brenna, but sharing her experience and contributing her words of wisdom to other blogs as well. She even created a Q & A series on Blessed by Brenna whereby someone could ask her questions about raising a child with a rare disease and she would provide answers, as openly and honestly as possible. Also, a friend of the Westlakes designed an IAM t-shirt for Brenna and sold it online. A big thank you to the Westlake family for their drive, passion, and commitment to raising awareness! 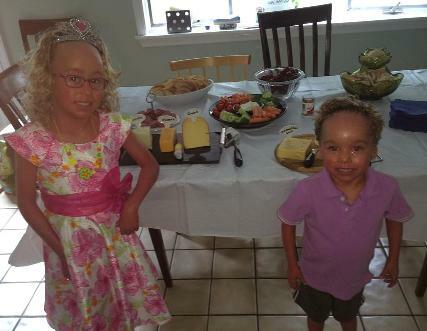 A big thank you to the Cina family, whose daughter, Portia and son, Myles are affected with ichthyosis en confetti, for hosting their 7th Annual Wine Tasting event in their home on May 31. Portia even sung for crowd while playing piano! It was a warm and festive way to wrap up IAM 2014. Plus, they raised over $2,800, including a donation from Sean’s employer, Toyota, Thank you to the Cinas and their entire community for your unwavering support! 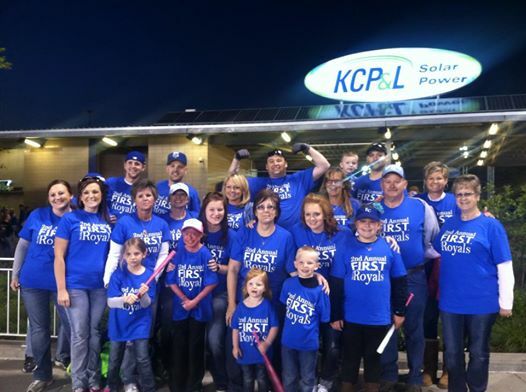 2nd Annual Ichthyosis Day at the K! “Ashlynne felt like a little queen again,” said mom Cora. Plus this year the Cossel family added t-shirt sales, a penny drive at Cora’s place of business, and a diecast Nascar car sale on Ebay! Donations totaled over $1,200! A heap of gratitude to the Cossel Family, and to everyone who participated. 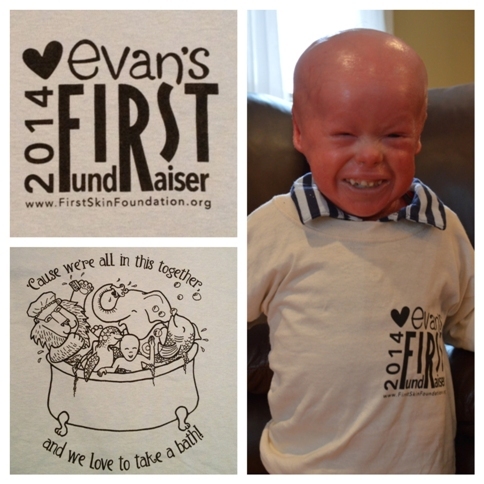 The Fasciano family, whose son Evan is affected with harlequin ichthyosis, created a whimsical “fun in the tub” t-shirt, with the slogan “we’re all in this together,” specifically designed to raise awareness of ichthyosis, as well as funds for FIRST. The t-shirt was sold online and mom DeDe worked tirelessly at preparing, organizing, selling and shipping, raising nearly $1,150! We are so grateful for their continued support and commitment and to their fantastic eye for fun, meaningingful and creative design! During IAM, Kimberly Cole, whose daughter Harper is affected with erythrokeratoderma variabilis(EKV) held a home-baked cookie fundraiser, raising $416! The next day her coworkers also got in on the action by giving an online donation of $100 for the “leftovers.” It was a delicious day of fun and family! Thank so much for all your efforts! Coin Collecting, Phantom Tea, Newsletter & More! During IAM, long-time FIRST member and supporter, Nancy Osentoski, affected with lamellar ichthyosis, took “grassroots” awareness raisin g to a new level! Nancy reached out to her friends and community in every way possible. Not only did she continually hand out information about FIRST and ichthyosis, while collecting “coin” donations at a local retailer, but there was a lovely article written about her in her local church newsletter, where she spoke about ichthyosis, FIRST, and our Phantom Tea Fundraising event (an event that she wholeheartedly participated in!). Nancy raised $250.00 at her coin collection station, and $445.00 through the Phantom Tea promotion! She has been doing such a great job promoting FIRST and spreading awareness. We are so proud of you Nancy for being such a strong self-advocate. You are a role model and a very dear member of the FIRST family! Bailey Pretak, affected with lamellar ichthyosis and Kalyn Clark, affected with congenital ichthyosiform erythroderma (CIE) turned their social media pages into full-blown awareness channels! Bailey explained about her ichthyosis on her Facebook page, encouraging her network to find out more and to donate to FIRST, as well as posting photos of her journey this year to meet several other FIRST members around the country. 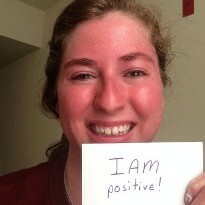 Kalyn embraced our IAM selfie campaign, by posting a selfie with an inspiring message every day of the month! Way to go girls! Member Tara Orme-Latrielle, whose son Myles is affected with lamellar ichthyosis, designed an inspiring Somee card, that truly expressed the essence of ichthyosis awareness month. Very creative, clever and thoughtful, Tara! Thank you kindly. Carly Findlay, affected with Netherton syndrome, once again posted a daily story reflecting “life with ichthyosis” (even while she traveled around the world!). 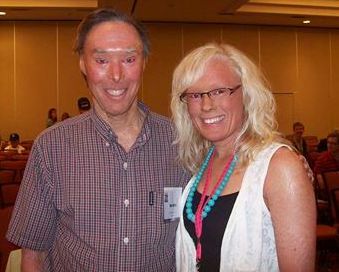 Carly has a knack for finding the most unique and special qualities in all of the ichthyosis patients she meets. 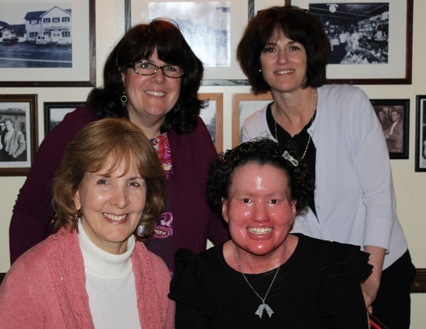 Her IAM blog series is an amazing tribute to them, their families, and the entire ichthyosis community. We are delighted to have been included in the line-up, for the past two years! Thank you for your courage and commitment Carly! The Robinson family’s daycare center dedicated a page of their May 2014 newsletter to the Robinson family, whose daughter Sienna is affected with (EI) epidermolytic ichthyosis. They shared information about her particular disorder, and what her day to day life is like, as well as information about FIRST. What a wonderful way to raise awareness throughout the local community!